Purchasing this product will earn you 165 Greenbucks! 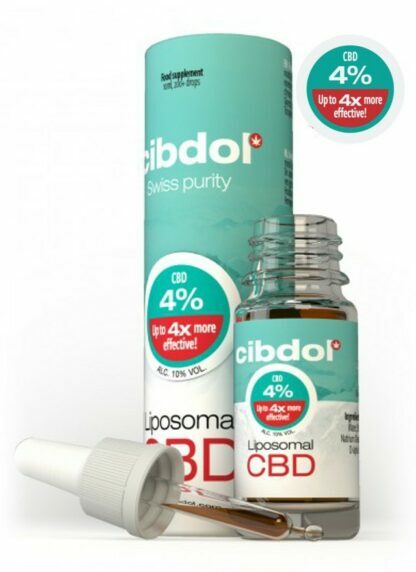 Cibdol Liposomal CBD 400mg 10ml is a liposomal formula that amplifies the already substantial effect of hemp-derived CBD, providing lasting relief when you need it the most. The combination of liposomes with a small percentage of alcohol allows CBD to be four times more effective than other oils as it is absorbed directly into the bloodstream. This also results in a quicker onset of effects that last considerably longer, making the formula ideal for anyone seeking an immediate lift. CBD advocates may be skeptical of the lower concentration of this product, however, due to the innovative formula, our 4% Liposomal CBD Oil is comparable to our traditional 20% CBD Oil. This higher dosage of CBD delivered to the bloodstream is the driving force behind this increased effectiveness.